To give you some idea of how long ago it was between buying this book and when I actually read it, the book makes a reference to the movie Jurassic Park being currently popular in theaters. When I read it, Jurassic World was owning theaters everywhere. 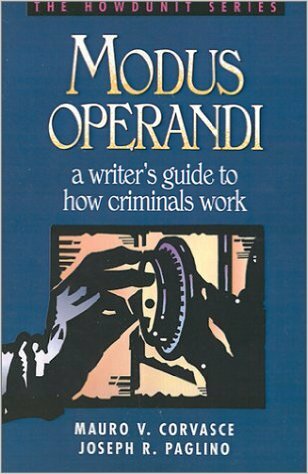 Despite being published in the mid 1990s much of the information in Modus Operandi, a writer's guide to how criminals work by Mauro V. Corvasce and Joseph R. Paglino is still relevant - especially if you're writing anything set pre 1996 and want to be aware of how things were 20+ years ago. A very useful book for anyone writing crime stories - even something as basic as a Scooby Doo style animated mystery - you'll find plenty of real world criminal behavior to structure a story around. Types of criminals include; Arsonists, Thieves, Hijackers, Con Artists, Counterfeiters, Fences, Murderers, Kidnappers, Prostitutes, Armed Robbers, Safe Crackers, Lockpickers, Smugglers, shoplifters and White Collar Criminals. Each chapter gives a general overview of that type of criminal or crime and describes some of the motivations, along with a basic overview of how such people operate and how they might be caught out. Some of the examples are based on both author's real world experience of working as detectives for the County Prosecutor's Office in New Jersey. I'm not saying it's a manual for how to carry out the perfect crime but it could be a good starting point, and it is enough to give your fictional characters some grounding in how real criminals operate. All levels of criminals are covered from petty street criminals to organized groups and gangs. If you just want to know the basics for each type of criminal without going too deep into every little detail this book has you covered. A great introduction for writer's just starting to explore shady characters and a very useful book to draw inspiration from if you wish to continue to write about criminal behavior.